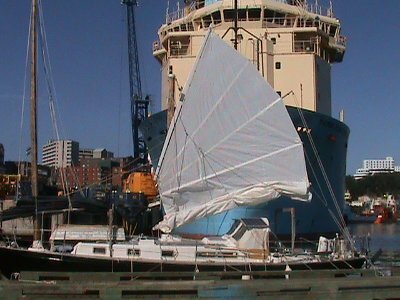 When I limped back to St. John’s Friday evening with a broken main mast I was reconciled to keeping my boat in Newfoundland for the winter while I sourced and installed a new mast. However, after spending the next evening with an extraordinary individual I was inspired to greater possibilities. When I opened my eyes the following morning and gazed at the junk rig blueprint plans on the bulkhead (now with a jagged line through the main mast where it broke), it dawned on me how I could use the remaining mast to re-rig a furled main sail of approx. 175 sq. feet. Together with the fore sail of 225 sq feet I would have around 400 sq feet, or approx two-thirds of the original sail plan of 635 sq. feet. 400 sq. feet of canvas would be enough to move the boat art a reasonable speed I figure. So I set about transforming the 14.5 foot main mast stump into a working mast and rig the main so as to have the full fan head and one panel to sail with. The main sail is now hoisted with a three part halyard and a modified topping lift to help contain the considerable bulk of the furled bottom four panels. I have omitted re-inserting the battens in the furled part of the sail and have lashed the lowest working batten to the boom. I have replaced the luff hauling parrel with standing parrels but kept the yard hauling parrel. I have extended the lower fan head batten and attached a single sheet block to its end.The boom/batten and and batten above have a sheet span connecting them attached to the sheet with double blocks (one on the sheet span, one for the sheet. I have sheeted it with first pull on the single block on the uppermost sheeted batten. Given this arrangement and the extra purchase of the single block, I believe incidence of sail twist will largely be eliminated. I am reasonably confident I will be able to achieve and maintain hull speed (5.5 knots) in winds of 10 to 13 knots with fast speeds at 15+ knots. The winds look favourable from Friday on and I will probably be experiencing winds of 20 to 30 knots later in the week. I am planning therefore to depart Friday morning. If I run into difficulty with the new arrangement I will return to port Friday evening and revert to my former plan of remaining in Newfoundland for the winter. If all goes well I will push on to the British Isles. So if there is no more entries in this blog by, say, Sunday or Monday, it means I’m going for the crossing.